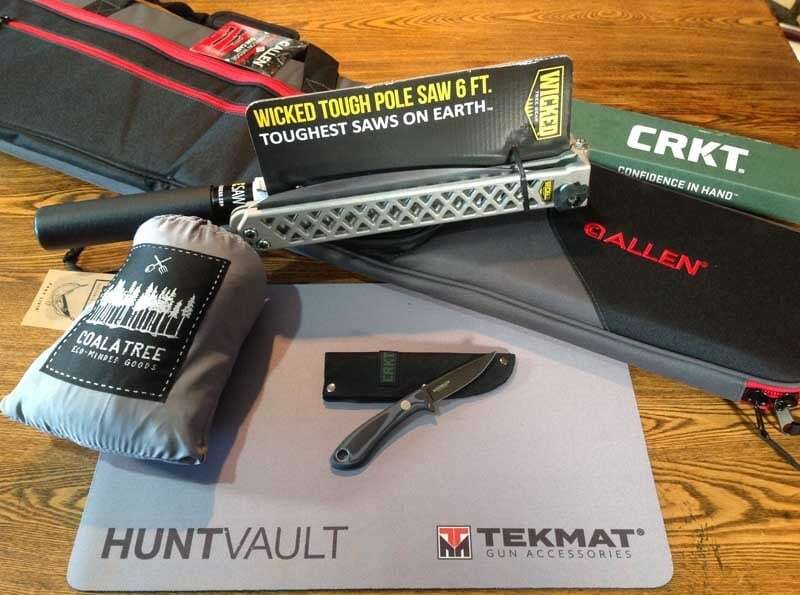 Hunt Vault is a subscription-based service that will ship to your home each month a box of hunting gear. The contents of each package vary depending on price and season. For $40 a month, or the discounted annual rate of $420, expect items like hunting tools, game calls, and safety gear. But I opted for the Elite package, costing $160 per month, that contains, as the company describes, premium gear like packs, optics, cameras and heavy duty hunting tools. My first package arrived in November 2018 in a hulky box measuring in at 29x17x 6-inches and containing six items. Each one varied in retail price from $14 on the low end to $130 on the high. So, already with the service I saved about $125 than if I bought everything from a store or online. The value ratio of this particular box was head-and-shoulders above other services. But still, was it worth it? TekMat – This is a 11×17-inch Hunt Vault-branded gun cleaning mat. The mat has a soft polyesters top with a light grey coloring, which makes it easier to see small parts. Best of all, the non-slip neoprene backing protects your work surface from the harsh gun-cleaning chemicals, as the entire thing is waterproof. Any gun owner can use a TekMat for disassembly, cleaning, or the like. Retail price is $13.99. Allen Gun Case – The Gunnison Wedge padded zipper case fits rifles up to 48 inches that have both a scope and bipod attached. Two long, exterior pockets leave ample room for any kind of accessories. Though this appears to be a discontinued Allen product, the open cell foam padding makes this a thick and very protective case with an Endura exterior. Regular price in stores is $29.99 on this Made-in-the-USA case. CoalaTree – The “Eco-Friendly Goods” company’s Loafer portable hammock. Weight limit of 450 pounds. The parachute-nylon nest measures 96×54-inch and weighs a scant 13.4-ounces. The hammock’s permanently attached stuff-sack doubles as a storage pocket while lounging. Included ropes and carabiners make hanging it at hunting camp a breeze. Retail price is $39. 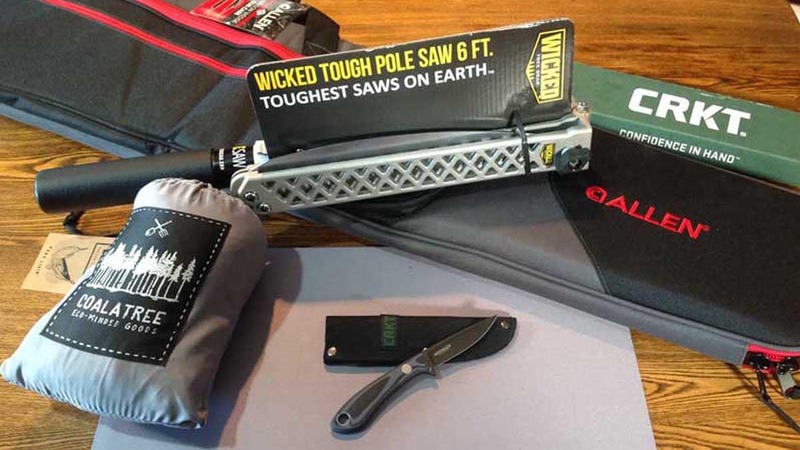 Wicked Tough Pole Saw – This 6-foot telescoping pole saw is a hunter’s dream, packing down to an impressively packable 19 inches closed and 2.5 pounds. The body is cast aluminum, while the handle has three expandable sections. Without a doubt, this is the most heavy-duty saw I’ve handled, and the 11-inch high-carbon steel blade is more than ample for clearing shooting lanes. They also make 12- and 15-foot lengths. Retail price on our 6-footer is $129.99. Total retail value of the items in the box, per our own calculations was $282.96. That’s not a bad return on what would have been a $160 investment. While the refund policy is determined “case-by-case,” the cancellation is rather flexible. However, one of the best features of the services is that Hunt Vault allows buyers to customize, with boxes tailored for huntresses as well. Their survey allows users to choose their game of choice, preferred weapon, clothing and boot sizes, and even whether they hunt with a dog. A 10 percent military discount further sweetens the pot.